This year the Amerimold Show is taking place in Rosemont IL which is practically in our back yard. 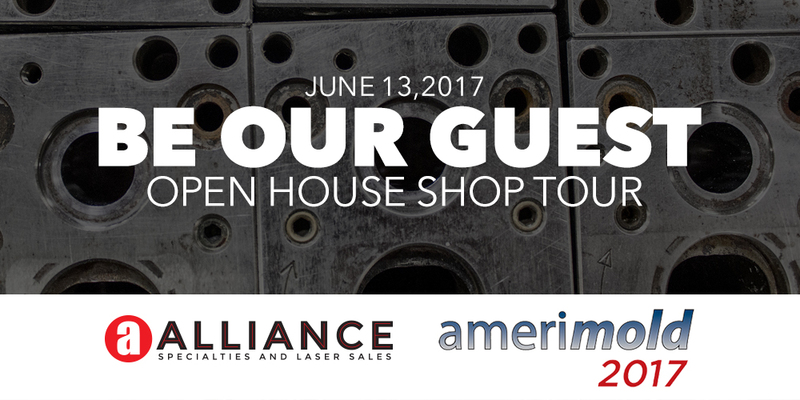 As always Alliance is looking to meet as many people as possible which is why we are happy to host an open house at our shop on June 13th from 9 am – 6:00 pm. We are extremely proud of our facility, our employees, and what we accomplish here on a day to day basis. We are opening our doors to you and your team to come spend some time with us while you are in town. The Alliance Open House Tour will be an all day event where you can come and go as you please, so there is no stress in making it by a specific time. If you need transportation from your hotel just call up the office and we will have someone come out and pick you up. Our goal as always is customer satisfaction so anything we can do will be done (within reason that is) to have you experience the Alliance Difference. Enter the promo code GUEST at registration screen.